We provide here a few screenshots to show how the basic results look as well as the graphical interface for setting up models. A few select features are also discussed. For more information download the software and give it a try for yourself or read the documentation. 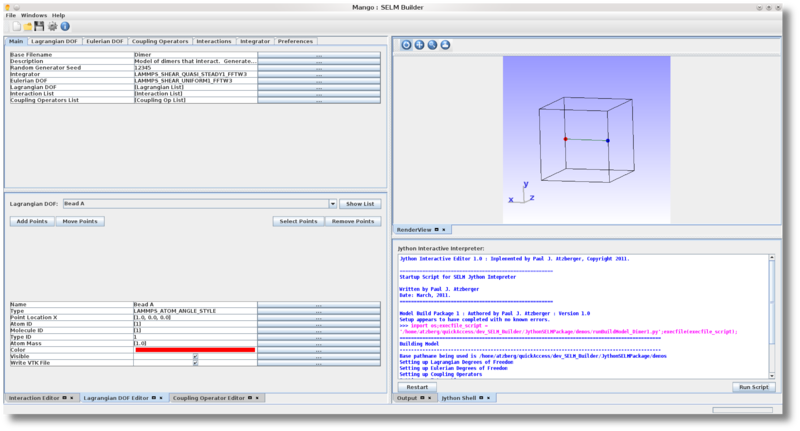 The Mango-Selm graphical interface allows for the specification of model geometry and simulation parameters through a graphical user interface. 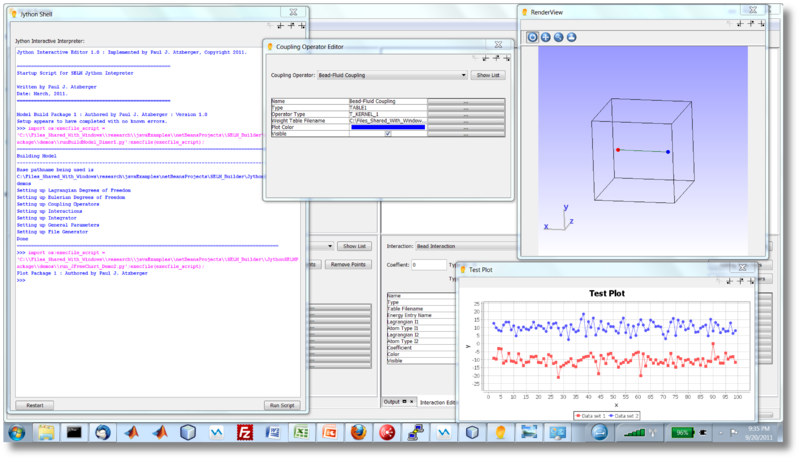 (Upper Left) The main panel that provides a spreadsheet like interface for setting model parameter values and attributes. In SELM this include specifying the time step integrator, geometry of the mechanical structures (lagrangian degrees of freedom), force interactions, and the fluid properties (eulerian degrees of freedom). (Upper Right) A rendered visualization of the model geometry and interactions is provided during construction. 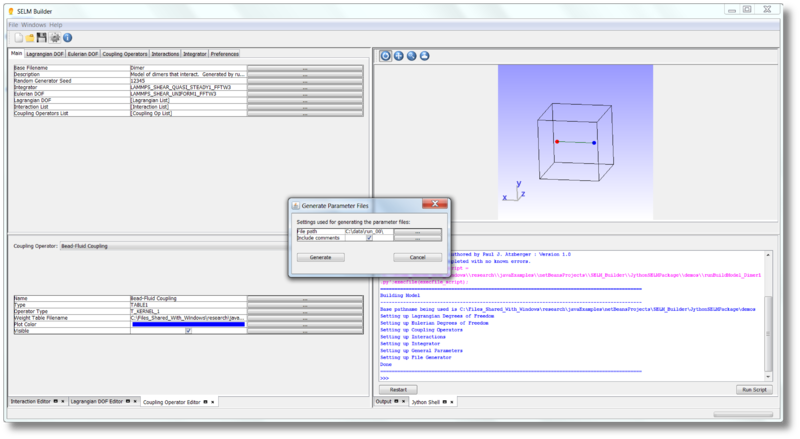 (Lower Left) Editors are shown for specifying attributes for the specific data types used to represent the mechanical structures (Lagrangian DOF Editor), force interactions (Interaction Editor), and coupling operators (Coupling Operator Editor). (Lower Right) An interactive interpreter for Jython (Java+Python) allowing for script commands to be executed to build models or specify parameters. Modifications are visualized in the interface as the script commands are executed. The Mango scripting language allows for the embedding of plots and other Jython generated output as a custom panel within the interface. 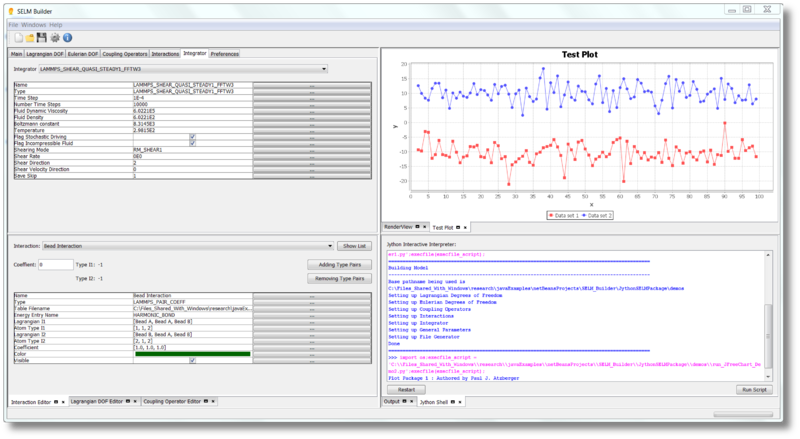 A package has been implemented in Jython providing access to plotting routines from the library of JFreeChart. This allows for a wide variety of different plotting types (bar charts, histograms, scatter plots). The plotting package also allows for interactive exploration of data, including zooming, dynamic editing, and tool-tip observation of data values. The Mango interface generates a complete set of parameter files for the LAMMPS MD-package and USER-SELM package. This includes a LAMMPS script that allows for easy command line execution of the specified simulation and XML data files that represent the SELM-based model, force interactions, and other parameters for SELM-related sub-routines. The Mango interface allows for panels to be undocked to a frameview with free floating windows. This is shown below.